There is only six days until the Ashbourne Weekend with CIT booking their spot in a semi-final against DIT or IT Carlow who play each other tonight for the top of group 1 in the Purcell Cup. 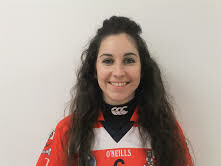 CIT Captain Jacinta Crowley looks forward to the weekend ahead. This entry was posted in News and tagged CIT, Jacinta Crowley CIT, Purcell Cup by CCAO PRO. Bookmark the permalink.